A call to Mike Rich at Yachting Partners International confirms that the owner of the 38.7m Gladius has authorized a substantial €1.6 million price cut as he awaits delivery of his new superyacht. Gladius is a joint central agency with Mike's colleague Matt Albert. Gladius was delivered in 2007 by Italy's Cantieri di Pisa yard, built to ABS class and MCA compliant. Her interior by Carlo Paladini accommodates up to 12 guests in a master, two doubles and two twins along with two Pullman berths and this superyacht has a cruising speed of 24 knots with a range of 700 nautical miles at 21 knots. 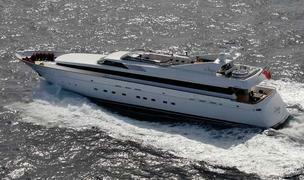 Gladius is now asking €9.9 million.